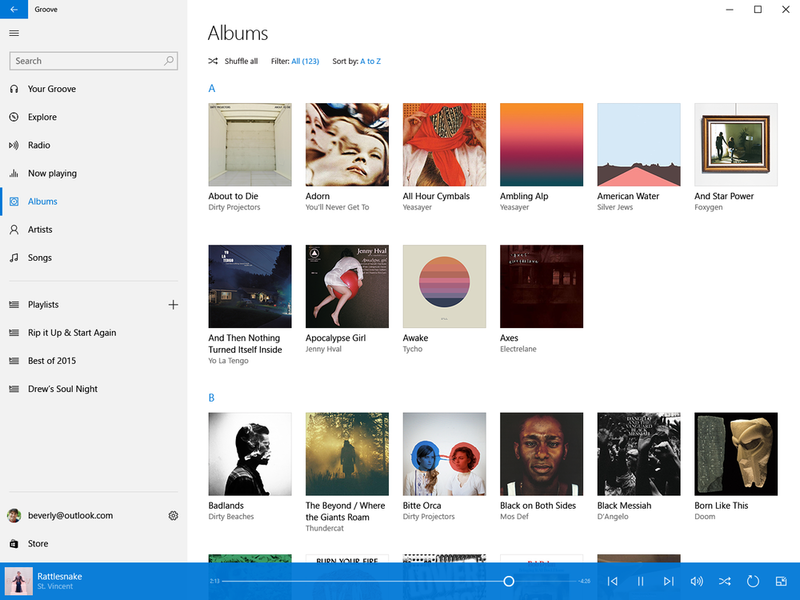 Groove Music is the new music player from Microsoft. Groove is the default media player for Windows 10, and is also available on iOS, Android, Windows Phone, Hololens, and Xbox One. From its origins in Zune and Xbox Music, the new Groove is a robust music player and streaming experience. I joined the new Apps Experiences team to work on Groove in June 2014 and have since led interaction design for its initial release on Windows 10 and Xbox, as well as significant updates to iOS and Android. Our team is actively working on updates to Groove across all platforms, with substantial new features in the social and creation arenas. Groove is the default music player for every Windows 10 device, and so must be simple and elegant to allow users to quickly access their music, whether it's on their device or streaming from the Groove music service. The design language is simple and airy, giving full attention to album artwork and user-created content. Groove is a great music app to play your own MP3 files, but also has a subscription service that provides unlimited ad-free streaming access to our catalog of 40 million tracks. I worked with teams in Redmond and in Paris to update our Explore section, which is our main point of music discovery. The Explore section of Groove showcases editorial playlists, genres, and other mood-based ways to discover music fast. We redesigned the Explore section to account for a variety of new music discovery features such as editorially curated playlists, mood-based mixes, and refreshed genre sections. The new Explore surfaces a wide variety of music types right away, and provides easy access to what's uniquely appealing to each user. Our Featured Playlists update daily to provide the latest and greatest from our editorial staff. One of the largest new additions to Groove is our personal recommendation service. Based on the music in your collection and your listening behavior, Groove generates custom playlists every day to suit your personal vibe. These are always stored in Your Groove, a destination for all your recommendations. In-process and exploratory work on Groove is protected by NDA, please get in touch for more information and process documentation.